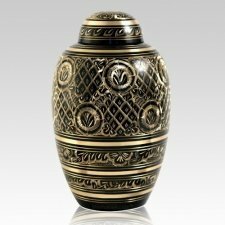 The Eternity Cremation Urn is an artistically detailed urn, a true piece of art that will preserve your memories for the ages. This urn is made from brass and etched to perfection. This urn is a beautiful piece of art! "I bought this for the cremation of my body but not before I have passed away. "When we received the Eternity Urn we were surprised at the quality of this Urn. Everyone commented on how nice it looked at the funeral home. With the passing of my mom’s best friend we are happy we went with the Urn.